Angie's List Super Service Award Winner for 2018! When Reputation Counts, You Can Count On Us! Proudly serving Gainesville, Florida and surrounding communities since 1994. Family owned and operated by J.J. & Elaine Callari, unique husband and wife team. 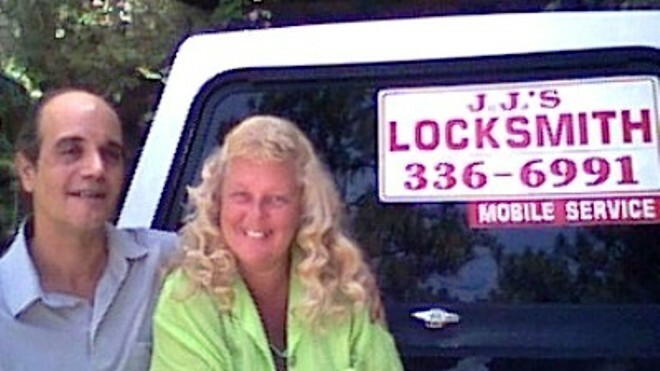 with 30+ years of locksmith experience. See our Service Menu page for more detailed information. Gainesville, Florida January 17th 2019 � J.J.�s Locksmith Service is proud to announce that it has earned the home service industry�s coveted Angie�s List Super Service Award (SSA). This award honors service professionals who have maintained exceptional service ratings and reviews on Angie�s List in 2018. Angie�s List Super Service Award 2018 winners have met strict eligibility requirements, which include maintaining an �A� rating in overall grade, recent grade and review period grade. The SSA winners must be in good standing with Angie�s List and undergo additional screening. Here at J.J.�s Locksmith Service, J.J. and Elaine Callari are very proud of receiving this award once again. We always strive to provide quality service at reasonable rates to create value and safety for our customers. J.J.�s Locksmith has been listed on Angie�s List since 2010. This is the unprecedented sixth year J.J.�s Locksmith has received this honor. Service company ratings are updated continually on Angie�s List as new, verified consumer reviews are submitted. Companies are graded on an A through F scale in multiple fields ranging from price to professionalism to punctuality. For over two decades Angie�s List has been a trusted name for connecting consumers to top-rated service professionals. Angie�s List provides unique tools and support designed to improve the local service experience for both consumers and service professionals. Thanks to all our clients and customers who gave us the opportunity to achieve this honor for the sixth consecutive year. We will continue to set high standards for customer service excellence, as we have for the last 25 years. This award from Angie�s List validates our efforts. Looking to the future, we will proudly continue to maintain these ideals. Angie�s List Super Service Award 2018 winners have met strict eligibility requirements, which include an �A� rating in overall grade, recent grade, and review period grade; the company must be in good standing with Angie�s List, pass a background check and abide by Angie�s List operational guidelines. Legally Certified Locksmith for quick and proven results. Angie's List Super Service Award for 2013, 2014, 2015, 2016, 2017 & 2018. Doesn't your home or business deserve the best value in a locally owned locksmith service? Alachua, Anthony, Archer, Bell, Bland, Brooker, Bronson, Campville, Citra, Copeland, Cross City, Cross Creek, Earlton, Ellisville, Evinston, Fairbanks, Fort White, Hague, Haile Plantation, Hawthorne, High Springs, Graham, Grandin, Hampton, Johnson, Jonesville, Keystone Heights, Lake Butler, Lake Geneva, Lawtey, Lochlossa, Louise, Lulu, Melrose, McIntosh, Micanopy, Mikesville, Monteocha, Newberry, Newnansville, Old Town, Orange Heights, Orange Lake, Putnam Hall, Raiford, Reddick, Rex, River Rise, Rochelle, Santa Fe, Shiloh, Spring Hill, Tioga, Theresa, Traxler, Trenton, Waldo, Williston, Windsor, Worthington Springs, amongst others. We manage our time very well; all appointments kept timely and we're always prepared to do the work requested. When reliability counts, you can count on us!